following affidavit concerning his connection with the Phagan case and with A. S. Colyar. 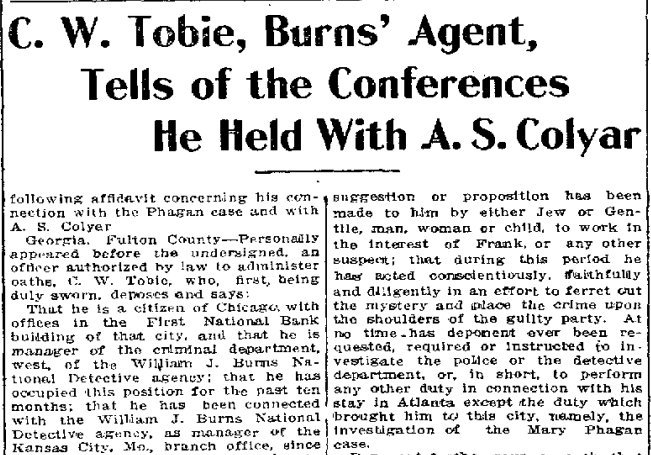 That he is a citizen of Chicago, with offices in the First National Bank building of that city, and that he is manager of the criminal department, west, of the William J. Burns National Detective agency; that he has occupied this position for the past ten months; that he has been connected with the William J. Burns National Detective agency, as manager of the Kansas City, Mo., branch office, since May, 1910; that for a year prior to that time he was connected with the Tilletson Detective agency, correspondents of the William J. Burns National Detective agency; that prior to that time deponent was connected with the Pinkerton National Detective agency for a period of nine years; that he severed his connection with the Pinkerton National Detective agency in May, 1909. Deponent says, on oath, that the statement that he was discharged by said agency is utterly, absolutely and deliberately false; that he resigned from said agency, and not under compulsion, but of his own volition. Deponent further says, on oath, that during the period of his labors as a detective covering the United States, Canada and some of the foreign countries, his work has never been brought into question, and his character as a man and detective has never been assailed. Deponent further says, on oath, that about two weeks ago he was instructed by Raymond J. Burns, the secretary and treasurer of the William J. Burns National Detective agency, who was acting under instructions from his father, to come to Atlanta on a murder case and report to Colonel Felder. Arriving in Atlanta he had a conference with Colonel Felder, and immediately entered upon the work at hand. Later he had a lengthy conference with Colonel Felder and Hon. Hugh M. Dorsey. Deponent further says, on oath, that for the past ten days he has been diligently at work in an effort to unearth the Phagan murderer or murderers; that during this time no hint, suggestion or proposition has been made to him by either Jew or Gentile, man, woman or child, to work in the interest of Frank, or any other suspect; that during this period he has acted conscientiously, faithfully and diligently in an effort to ferret out the mystery and place the crime upon the shoulders of the guilty party. At no time has deponent ever been requested, required or instructed to investigate the police or the detective department, or, in short, to perform any other duty in connection with his stay in Atlanta except the duty which brought him to this city, namely, the investigation of the Mary Phagan case. Deponent further says, on oath, that the statement imputed by an afternoon paper to Colyar to the effect that I informed him at the Piedmont hotel that I was going to Colonel Felder’s office “to meet a committee of citizens, among whom were Mr. Hirsch, Mr. Meyer and Mr. Greenstein, and several other prominent Jews in the city,” is a deliberate, malicious and willful falsehood. As a matter of fact, I never heard of either one of these gentlemen until I read their names in the papers on yesterday afternoon, and I have never met them or either of affidavits, whereupon the said Colyar elsewhere, and deponent firmly believes that this statement is made as a part of a well-planned conspiracy to discredit his efforts, and the efforts of Colonel Felder, to unearth the Phagan murderer or murderers. Deponent further said, on oath, that he never laid eyes on Colyar in his life until he met him at the office of Colonel T. B. Felder on Sunday evening, May 18. At the time of deponent’s arrival at said office, the conference between Colyar and Colonel Felder, which had evidently been brief, was drawing to a close, and at Colyar’s invitation, I made an appointment to meet him at the Piedmont hotel on the following morning, as he stated that he had very important information in connection with the Phagan case, which he desired to impart to deponent. After meeting at the Piedmont hotel, the said Colyar stated to deponent that he had a number of affidavits involving the chief of police and chief of detectives which he desired to submit to him, that he was not here on that mission, and declined to examine the telephonic communications from him stated to said deponent that the city police and detective departments were undertaking to discredit Colonel Felder’s, Solicitor General Dorsey’s and deponent’s efforts, and added that deponent had three things to fight, to-wit: Jealousy, politics and money, and repeated it by saying: “Remember now, you are up against J. P. & M.” Deponent reached the conclusion almost instantly that this man was a crook and humbug, and thereupon ended the interview abruptly, and although he has received numerous telephonic communications from him since, he has declined to meet him at his hotel or elsewhere in the city of Atlanta. Deponent further says, on oath, that he is advised and believes that in his diligent efforts to unravel the Phagan mystery, he has been obstructed by some secret agency at every “turn of the road.” In his efforts to interview witnesses he has found them reluctant to answer questions and to give him necessary information, with the result that deponent reached the conclusion that said witnesses were acting under instructions in their conduct. Deponent further says, on oath, that there is nothing in the Phagan mystery different to other mysteries, and that with the co-operation of the agencies that should be in sympathy with the efforts of the William J. Burns National Detective agency, guilt should be fastened upon the real criminal by absolute and conclusive evidence. Sworn to and subscribed before me, this 24th day of May, 1913.